If you’ve taken part in FMM then you know the rules. If you’re new, please take a moment to answer this week’s question on your own blog then add your link in the comments section in Kenlie's blog at: www.alltheweigh.com so we can all see your FMM questions and answers. Please invite your blog readers to add their links here too so everyone has to opportunity to be seen. The idea is to connect with other awesome bloggers so take a moment to post your own FMM post and comment on a couple of other posts. Now it’s time for this week’s topic! 1. What is your favorite meal to prepare at home? Right now, nothing. Husband's been doing most of the cooking this whole semester (bless is little heart) because I just... Nope, it's not happening. I walk in the kitchen with intentions to cook, take one look at the dirty dishes in the sink, and walk right back out. I can't do it. And I can't muster the motivation to constantly clean my kitchen or pester Husband to do it (cleaning the kitchen is "his" chore) so I just... Forfeit. BUT, all that anti-housewivery aside... Once school is finished, I will polish up on my housewife skills and get back to cooking/cleaning (hopefully, anyway). Okay, but now that I said all that.. One thing I have been craving lately that I've taken the time/energy to actually make is hard-boiled eggs. I know, it's a silly thing to crave, but I have been a lot so they're almost always on hand. I mash 3 hard boiled egg whites with one whole egg, add in 1 tbs of fat free mayo, some dill, paprika, and today I also added 1 tbs of sweet pickle relish. Mmmm... Makes me want some NOW! 2. Do you like to experiment in the kitchen, or do you prefer to stick to the basics? While we're going a million miles per hour all the time and hardly ever eating together, we stick to the basics. I love to experiment and try new things, but our schedule and my lack of brain power at the end of the day just doesn't call for it. Only one week til graduation!! We're almost there! 3. What is your favorite cookbook? I own very few cookbooks, Pioneer Woman being my favorite. Of course, her food doesn't easily lend itself to weight loss so we haven't used the book in over a year. That being said, I find most of my recipes for our diet online or in my 17 Day Diet book. 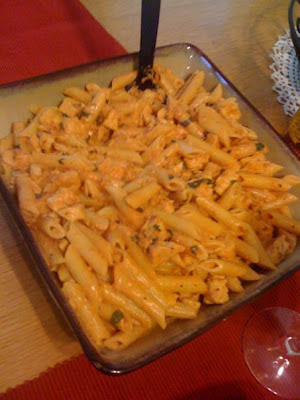 Pioneer Woman's penne a la Betsy, with chicken instead of shrimp. One of my favorite recipes I've made of PW's. 4. Do you have any tricks to share that help you reach your fruits and veggies goal for the day? Well, back when I was a stickler for weekly grocery trips (and therefor had fruits & veggies aplenty) I would have a serving of fruit with breakfast and a serving as a snack between breakfast and lunch or a serving with lunch. I tried to have 2 day and fit them in before 2 PM (as directed by the 17 Day Diet). One trick I've found works best for us to make sure the fruit gets eaten before it spoils is separating it out beforehand. Things like grapes, strawberries... anything that has to be washed and prepared beforehand I try to do as soon as I take it out of my grocery bag, before it ever goes in the fridge. I also separate grapes out into separate Ziploc bags for easy access to throw in our lunches. As far as vegetables go... I use carrots as my go-to binge filler. When I'm feeling like eating a LOT of something because I'm just... craving... I go grab carrots and mindlessly eat the hell out of them. That way, I can eat and eat and eat and eat (and eat and eat) and not feel bad about it. This doesn't happen often, by the way, but I find that carrots are good for that. I also often will have my "big meal" of the day at lunch and have a large salad for dinner. Maybe it's the European in me, but I find that I enjoy having my bigger meals earlier in the day. Typical dinner salad: romaine and spinach leaves w/feta cheese, grape tomatoes, and some type of vinaigrette. I wrote a post a long time ago about the salad I had every night for the longest, because it was so delicious. View that post here. 5. What’s the most interesting thing you made last week? Wait, I cooked last week? Oh... No. You have me confused with someone else. Sorry! I definitely didn't. Unless you count a salad as cooking. 7. When you’re hungry, where are you most likely to look first? The refrigerator, or the pantry? Neither, I don't have anything in either one. If I'm craving bad enough to look for something to eat, it turns into a binge and I go get fast food (again, doesn't happen often). 8. List a few healthy staples that can always be found in your kitchen. We always have grilled chicken tenderloins, frozen vegetable (Bird's Eye broccoli, cauliflower, and carrot mix, to be exact), yogurt, eggs, romaine lettuce, canned diced & crushed tomatoes, and turkey patties. 9. Are you motivated to cook at home even when you’re eating alone? No. If I'm alone, I usually have leftovers or a salad. Actually... I only ever have leftovers or a salad when I'm alone. Don't forget to head back over to Kenlie's and leave a link to your blog if you participate! Your answer for number 5 made me smile. I love the PW cookbook too - her blackberry cobbler is, hands down, my favorite - total manbait. Used to make it once a week, I'd say! But I haven't opened the cookbook at all since losing the weight!